All men's miseries derive from not being able to sit in a quiet room alone. Do you live in a great location? Close to good schools, restaurants, trendy shops and transport? Or maybe you have neighbours who entertain long into the night or constantly renovating with no end in sight? Or perhaps your teenage children have a penchant for playing loud music of the heavy metal genre and you do not share their taste? Have you caught yourself feeling that you just want to get away from the noisy and hectic atmosphere? Noise pollution is often overlooked as a serious environmental problem, yet it detrimentally affects the health of humans and animals. Research shows that continuous exposure to noise levels at or above 65 dB can increase blood pressure and stress levels measured by release of adrenalin in the blood. Exposure to high noise levels can also damage the delicate hair cells in your inner ear causing your hearing to deteriorate. Noise has also been found to cause headaches, migraines and gastric problems. Approximately 10 percent of people living in industrialized areas have substantial hearing loss and children in the USA have an impaired hearing at a rate of 250% higher than their parents and grandparents. Noise-induced hearing loss, though preventable, is permanent! When your sleep is continuously interrupted by noise (levels over 30dB can disrupt sleep) and you always feel tired and irritable, don't take multivitamins or sleeping pills - get to the root of your problem: install Double Glazed Windows and Doors to eliminate the unwanted noise. It is no surprise that so many of our clients report a noticeable lifestyle improvement. Review the table below to check whether you and your family are at risk. The maximum level of noise exposure that humans can withstand is 120dB. Most people start to report severe discomfort with noise levels above 50 dB. The nuisance factor of noise also depends on the noise frequency and the type of noise. It is no surprise that most people are more averse to aircraft noise, as opposed to children laughing or birds singing. It is important to identify the type of noise you wish to insulate against, as there are thousands of glazing combinations, so that we can optimise results for your specific needs. Superior quality German profile with built in resistance to UV radiation and high impact strength. Multiple chambers inside both frame and sash for improved insulation against heat and noise. Allowing for structural stability through the use of aluminium or steel reinforcement in the central cavity. The glazing rebate space allows for 32 mm insulated glass unit with thousands of glass combinations for many applications. Dual High Compression Seal provide effective control of environment including air-tightness and acoustic insulation. New developments in technology have enabled us to source the best hardware on the market to ensure trouble free operation and added security with the use of multi locking mechanisms in every window, while allowing for some customisation. Finally, the manufacturing process of welding, rather than mechanically joining present further benefits of structural durability and prevent water or air leaks. uPVC units are welded and have multiple chamber construction, these two factors along with the thickness of glass provide the finished product with excellent acoustic insulation and coupled with appropriate glass combination in a 32 mm Insulated Glass Unit, against high or low frequency noise can make a dramatic 40-45dB, reduction, improve your sleep, decrease stress and add re-sale value to your home. The multiple chamber design when combined with appropriate double glazing, firstly forms a double barrier that reflects sound waves before they have the opportunity to create vibrations and noise, and secondly for the remaining sound waves, the multi chambered profile acts to redirect the noise to bounce around and looses strength. The combined effect is a significant reduction in noise levels that is specific to Window Factory Double Glazed Windows and Doors. 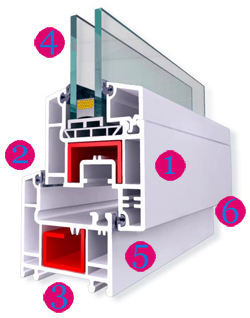 For added high thermal and acoustic insulation qualities, double seals are used between the sash and the frame ensuring excellent weatherproofing and noise insulation when closed. The upvc profile for both frames and sashes is fusion welded together, this impedes leaks and gaps that may be created with mechanically joined windows and doors. There is a direct correlation between air-tightness and insulation performance of a window or door, and the factors that contribute to the tightness of a window include gaskets and correct installation. Inferior gaskets and poorly installed Double Glazed Windows and Doors can lead to a reduction in noise insulation of between 5-20dB. With Window Factory Double Glazed Windows and Doors, a complete air and watertight environment is created, which ensures acoustic and thermal insulation for the users. Acoustic glazing will improve the performance of the unit, to extend performance even more. Research indicates that combining glass of different thickness, called asymmetric glazing, performs better in reducing perceptible noise levels, when compared to double glazing incorporating exactly the same glass panes. For high frequency noise, the use of laminated glass can also produce an additional 3-5 dB reduction, especially when asymmetric glazing is used. Laminated glass is made by two glass panes joined together by a transparent elastic, and is commonly used as safety glass because during breakage the glass does not crumble and remains attached to the lamination. The use of lamination and asymmetric glazing can be used to improve the performance of your Double Glazed Windows and Doors even further, but the most important factor with a positive linear relationship with the degree of acoustic insulation, is glass thickness. Generally, the thicker the glass, the thicker the acoustic barrier that the glass provides, and the greater the reduction in noise levels. Remember, that although Window Factory Double Glazed Windows and Doors are potentially acoustically efficient to 45dB, this only applies to closed windows and doors. If your Double Glazed Windows and Doors are open, the benefit of noise insulation will be dramatically reduced with the number of Double Glazed Windows and Doors that are open. For clients that like to have fresh air inside the home, but also want acoustic insulation, we recommend opening all the windows and/or doors, for short time intervals, throughout the day (or morning and night), to take advantage of cross ventilation, but keeping the Double Glazed Windows and Doors Closed at other times. In the case of a new construction, it may be useful to consider how to balance the need for ventilation and the need for acoustic insulation and discuss this with the architect. For new constructions in areas affected by highway/aircraft noise, we recommend consultation with an engineer specialising in acoustics, for a holistic approach inside the home to maximise results. Even if there is no immediate and desperate need to insulate the home consider that the acoustics of a space designed for speech must primarily ensure clarity and intelligibility, therefore it is important to design spaces for optimum reverberation time and spatial-temporal aspects including the time delay between the direct and first reflected sound. Other factors to consider may be size and style of the windows. Some window types, regardless of the frame material and even glazing, perform better than others, in terms of noise insulation, for example, test results show that sliding windows and doors are the least thermally and acoustically efficient. Also, in the case of awning windows, the smaller the sash, the wider the potential opening for awning windows, so if the need for ventilation together with noise insulation is a joint priority, for better results, we recommend maximising the number of sashes while decreasing the sash size. The opening Double Glazed Windows and Doors may be coupled with fixed panels for a breathtaking glass feature. The durability of the upvc and the high quality hardware translate into many years of trouble free use. They don't warp, fade or crack and just require a quick and easy wipe down every so often. Because of plastics inherent resistance, your Double Glazed Windows and Doors will be low maintenance, and don't require any effort on your part to take advantage of the noise insulation benefits of your Double Glazed Windows and Doors.